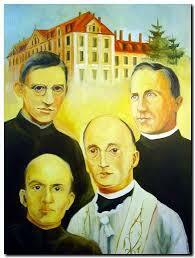 Luis (Ludwik) Mzyk (1905-1940) was martyred as novice master of the Polish Province. After philosophy studies in St. Augustin he was sent to study in Rome where he was ordained in 1932. He applied to work as missionary in Japan or China, but the superiors appointed him for Poland where the SVD need qualified personnel and where the initial formation program had just began. So, he continued his stay in Collegio del Verbo Divino, studied dogmatic theology at the Gregorian University, and finished his study with the doctorate. In the Polish Province he became novice master at Chludowo. Short after the beginning of the war he was arrested and put in the maximum security prison in Poznan where he was cruelly killed on February 20, 1940. Gregory Frąckowiak (1911-1943). He is the youngest one among the four martyrs and was beheaded in the prison in Dresden on May 5, 1943 when he was 32 years old. As receptionist and bookbinder he showed a special sensitivity to the poor who used to come to him asking not only for material help but also spiritual help. At the beginning of the war in 1939 the SVD house in Górna Grupa where he stayed was closed down and confiscated and the confreres were expelled. He went to his family. Some people were involved in distributing the fliers against the Hitler’s dictatorship. For some time he was also involved in this action but after a time he stopped doing it. The group was discovered and many persons were arrested. It was clear that some would be sentenced to death. Bro. Gregory, after consultation with his confessor, freely presented himself to the police and took responsibility for the distribution of the fliers. Due to his sacrifice some fathers of families were allowed to rejoin their families. Brother Gregory was brought to Dresden where he was beheaded. Many others met a similar death not only in the Hitler’s time but also in the first years in East Germany under communism. Stanislaus Kubista (1898-1940). He was a mission animator and communicator. His contribution to mission animation is amazing. As director of the SVD printing press in Poland he shared the Founder’s enthusiasm for the printing and editorial apostolates. He edited two missionary magazines, wrote articles and published a book. After his arrest, he was sent to the concentration camp at Sachsenhausen where he was killed with extreme cruelty. According to witnesses who survived, he died maintaining his priestly and religious dignity. Aloysius Liguda (18989-1942). He was good educator and was often sought out as a spiritual director. As chaplain in the schools he was appreciated and loved by young people. His conferences during recollections and retreats were valued. One of his books of conferences went into three printings. Our reading for the Office of Readings today is taken from his writings. A man of great tranquility and with a sense of humor, Aloysius was of enormous help to other prisoners in the concentration camp in Dachau. In a situation of human horror he was able to help people spiritually and psychologically and encouraged them not to give up. Along with nine other prisoners he was drowned in Dachau on December 9, 1942.